On Thursday, September 13, Scholastic employees in New York City gathered together for the Company’s annual National Advisory Council (NAC)—a group of education experts from across the country with on-the-ground experience who share their insights into critical issues, needs, and challenges facing educators today. In the 1930s, the first meeting of the NAC was comprised primarily of school superintendents and today, represents a wide spectrum of educational leadership. Q: How does your role connect to the topic of equity? Sydney Chaffee: Equity is deeply embedded in what I do, and it underscores every decision that I make. I’m always thinking about how I’m going to help every single one of my students have access to a high quality, rigorous, relevant, and authentic education. I am constantly calibrating the things that are in the way of all of my kids succeeding, and I think about the barriers I may have unknowingly put in place for my students. I’ve had the opportunity to travel and speak about this work, and I’ve been able to advocate for equity, pushing the conversation past these nebulous ideas of what equity is and into concrete discussions about how equity affects kids, teachers, and schools on a daily basis. For me, equity always comes back to the kids in my classroom and what they need to succeed. Pedro Rivera: Equity is not a box that you can check off and move on from. 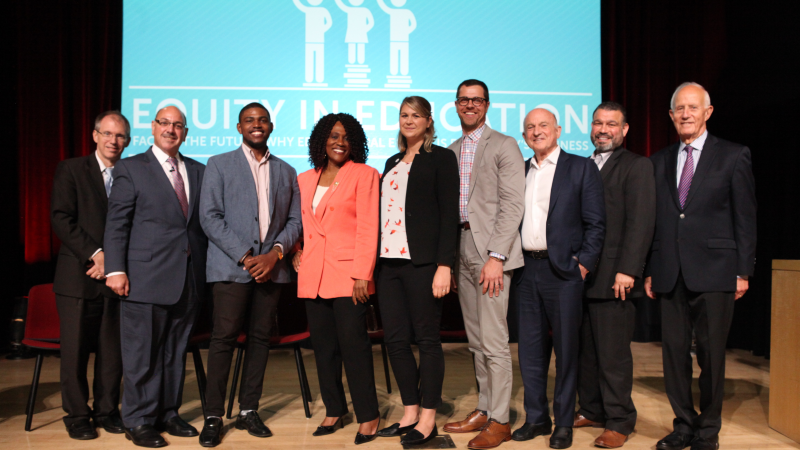 In the Pennsylvania Department of Education, we discuss making sure that we are equitable in terms of distribution, alignment, identification, support, and differentiated measures to ensure that everything we do addresses the needs of our diverse student population. We make sure to engage the community to better understand what they need to be successful, and then we work to set a vision and provide opportunities. We’re shifting our role from compliance to active support for all of our school districts. Daniel Gohl: So many communities are feeling judged, and this is the challenge. We need to ensure that communities get to articulate what they want, and have it reinforced by what the authority says. Every kid upon birth should expect to be able to read, and as an American society, we’re not delivering that. If our communities entrust their children to us, then they should be able to read. This is our charge as educators. Fay Brown: As educators, if we are going to achieve equity in the classroom, we have to get to know our children outside of their school work. We have to know how these kids are as human beings. My research focuses on the Developmental Pathways Framework in which we look at kids through six pathways covering cognitive, physical, language, social, ethical, and psychological development. All of this comes together to form the whole child and needs to be looked at when determining what kids need to succeed. Jordan Weymer: There is no equity without empowerment. Until our students and families feel that they are empowered, that their voice matters, that they have choice, then it’s impossible for there to be equity. That’s the work ahead of us, and ahead of me as a school leader. Brandon Dixon: As a student of history, I study how these inequities formed in the first place which is so important for developing processes to dismantle them. In addition to being a student, I am a journalist. I help to amplify the stories that come from our classrooms, and help teachers understand the students they will be teaching in 2030. If we don’t think about the future while maintaining an understanding of the past, we will continue to repeat the same mistakes. Vito Borrello: How can educators know their students if they don’t know their students’ families? It’s common sense, but it’s not common practice. This is exacerbated in low income communities when there are barriers such as poverty and language. My work at NAFSCE focuses on looking at these systemic obstacles and helping educators and families come together to engage as partners in education. Q: What are the two or three most important skills that you think a student graduating in 2030 needs to demonstrate? Fay Brown: We tend to focus so much on the cognitive skills our kids have, but kids also need what are often referred to as soft skills. But they are not “soft” skills—they are necessary skills tied to personal intelligence. If you don’t know how to get along with other people, you will not make it in this society regardless of how intellectually gifted you might be. Pedro Rivera: First and foremost, we want our students to be continuous learners. The coursework taught in schools is only a foundation and it must be built upon to ensure the success of our students as they progress through life. We also need to teach our students how to be engaged and contributing learners in a broader community. Sydney Chaffee: Educators are thinking about the importance of social-emotional learning. At my school, we have all of our standards, but we also have five habits of scholarship that we reinforce for all students from pre-k to grade 12. These habits include responsibility, effort, collaboration, critique, and compassion. We try to connect every lesson we teach to at least one of these habits, and we ask our kids to evaluate themselves against them. These habits are what I want my students to be really good at. Jordan Weymer: Our student government came to me recently with amazing ideas for an Immigrant Pride Week, complete with t-shirts, fundraisers, and a march through the streets of Boston. I told them to go for it, and what they put together was beyond remarkable. There were 11-year-olds calling the Boston Police Department asking for police escorts and to make sure that the streets were closed. They were calling the parks department to see whether or not they needed a permit to have a rally in the park. They were doing logistical work, they were utilizing math to allocate funds, they wrote speeches, and they reached out to advocates to attend, all on their own. Think about the skills embedded in that. Those skills are timeless. Brandon Dixon: Educators need to be deliberate about how they talk to kids, especially when it comes to the skills we want them to learn. Kids need to be treated like regular human beings. I think that’s the key to getting kids engaged and excited about learning those skills. It’s one thing for us to know what needs to be done, but if our students don’t buy into it, then we’re failing. Stay tuned for Part II to see more insights from the 2018 NAC members.